The Book of Unholy Mischief - Audiobook (abridged) | Listen Instantly! Elle Newmark's richly seductive prose brings to life the color and scandal of fifteenth-century Venice. Through Luciano, a street urchin apprenticed to a great chef in the palace of the doge, Newmark tells a wicked tale of political and papal intrigue. In Venice where every whisper is a secret or a lie, Luciano's initiation into the chef's spicy world makes for deliciously suspenseful listening. The Book of Unholy Mischief is more than terrific historical drama; its a love story, an investigation into ancient religious secrets that haunt us today, and its a story of intrigue replete with pulse-pounding chase scenes, murderous assassins, torture chambers and conniving, desperate characters. It's beautifully written, authentically detailed, and fiendishly well plotted. Listeners will want their friends to read or listen to it so they can talk about it over dinner in their favorite Italian restaurant.
" I read this a while back. It was not my cup of tea, but the writing was good. " " I enjoyed this epic tale, despite its wandering down some paths already traveled. The food writing was inspirational, the characters well-developed, the history interesting. A good insight into what life was like in 14th century Italy. " " set in Italy, this book is C+ "
" Interesting composition of orphan taken in by cook who holds secret recipes as part of Gospels. I loved the intersection of all of the elements into a workable story. " " I enjoyed this book. It was easy to read and I enjoyed the descriptions of the various dishes, tastes and textures (although I had to google some of them :)). Didn't quite agree with/enjoy the Gnostic influences, but I decided towards the ends that this was more a tool the author employed to create the story rather than her own opinion. Would try read her again :) "
" I found this book very slow going and not really everything it promised to be. I expected much more mystery and action, it was in fact very predictable saved only by the intriguing receipes and the description of Venice during the period. It was an average read "
" Venice,Italy, food and mystery set in the year 1498 on the eve of the Renaissance make for a great yarn. The audio is very well done, and proceeds building up the pace and the mystery. " " This was great! The story of a poor boy taken in by a medieval chef, it rolled Long with intriguing characters and a plot about a magical book, which uses recipes as secrets. A really enjoyable read! " " Leuk boek, dat makkelijk wegleest. Heerlijk vakantie voer. " " Couldn't put it down. Had my sister read it out loud to me on a road trip to Boston! I was driving and couldn't wait the 3 hours before I could pick it up again. :) "
" Another book based around cooking, yet missing the real engagement with the time (Venice, late 15th Century), and the kitchen. Not a bad read by any means, and quite amusing concepts but only a couple of stars from me. " " Not at all what I was expecting but I hung in there and am glad that I did. Wonderful descriptions of life in 15th century Venice. Discusses the art of cooking. My main beef with this book is that I found most of the characters unappealing. " " This is why I read "
" A little slow getting started for me but on the whole I enjoyed this historical fiction account of Rennaisance Venice. It was interesting how the author tied the art of fine cooking into the plot which added a unique twist. " 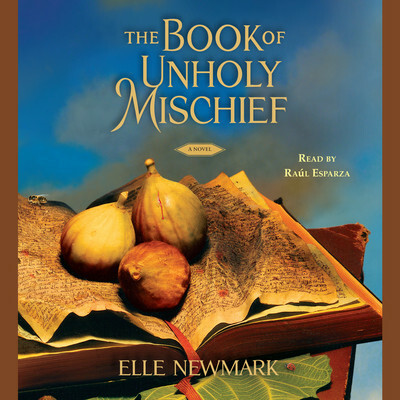 " I was drawn by the name of the book, but it ended up to not really be anything about "Unholy Mischief". However I did enjoy the book more as I got into it. It made me want to see Venice. And I did enjoy the story of a secret group of Guaardians and their desire to spread knowledge however they can. " " This book is set in Venice in the 1400s and has an interesting premise, but is very anti-religion. " " an easy read, and fun if you're into food and bashing mainstream religion. " " Really enjoyed this book. Loved the Venice component, the cooking and some mishchief. The relationships are well developed and enjoyable. " " Great read! Historical depth and accuracy is brilliant. " " If you like a mystery, cooking, historical fiction of Renaissance Italy, you will like this book. " " It was interesting story, but think it will be forgotten soon. It took me a whole month to read, a little each night because I wasn't excited to pick it up. Has some interesting, and far reaching, ideas about religion. " " At this point , I can't put it down "
" Good, but not spectacular. Story of Venice (again) and secret ancient books (again) with the novel twist of the Chef for the Doge being the keeper of said book and a street urchin his apprentice. " " I liked the basic story line but not much else "
Elle Newmark, born Ellen Ferrero, is the acclaimed, award-winning author who finds inspiration for her books from her travels. She lives and works in the hills north of San Diego but grew up in her father’s Italian farming village and Chicago.